Kure Imperial Lager is an 8% imperial lager from Kure Beer, based in Hiroshima, and is it is a part of their seasonal line up. It can be found from the middle of November onwards and has an IBU of 95 units, verging on double IPA territory. At the time of writing, it can only be found in bottles only and has a recommended shelf life of around four months, so get it while it’s available. An imperial lager but tastes so much better in an IPA glass. After seeing that Kure Imperial Lager had an IBU of 95, it made sense to put this beer into my IPA glass, which just so happened to be the last beer to go in this glass as it broke soon after. Why these glasses are paper thin are beyond me, but it’s now the third glass to break on me, even after careful handling. Spiegelau should make these glasses out of adamantium or something else unbreakable, like diamonds! That sounds like a wonderful idea, a diamond IPA glass. 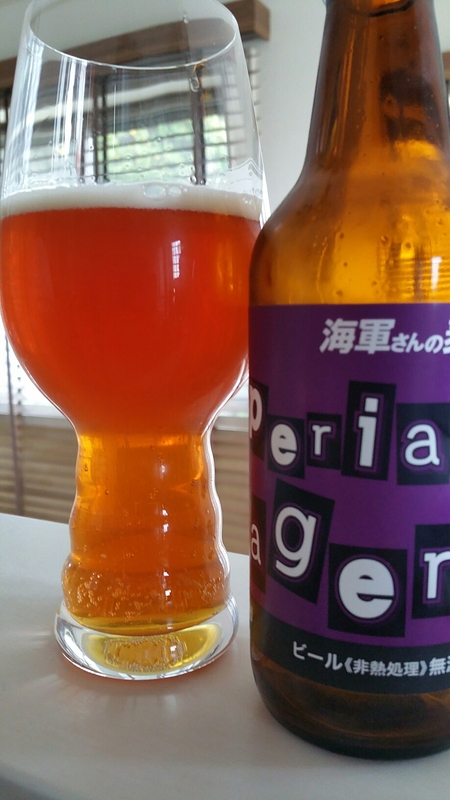 Kure Imperial Lager poured out a golden-orange colour with a minimal amount of head.With such a high IBU, I wondered what would come through: the malt or the hops, and the hops that came through on the aroma. Just. It had a huge citrus aroma of oranges and some resiny pine hints too. The malts came through in the end, with a pungent roasted caramel aroma along with some breadiness too. I couldn’t decide in the body though whether Kure Imperial Lager was meant to be a sweet lager or a hoppy bitter aroma as it veered towards both during drinking. The caramel flavours were a tad too sweet for my liking and then the hop bitterness kicked in to remove the sweetness away. The jarring veering between the two extremes was pleasant at first but after the sixth gulp / sip, it got a bit old and I wanted it to stick to one style. The aftertaste followed the body with it starting out sweet and then moving towards bitter. Kure Imperial Lager is such a mash-up of two styles that it does neither of them well. It’s an average beer at best. I got my bottle from Liquors Hasegawa.